When people think of wooden walls, many remember the wood paneling of the 70s found in homes across America. But these days, wooden wall treatments have gotten more versatile, more durable, and a lot more stylish. Thanks to modern design sensibilities that place an emphasis on organic textures and natural motifs, wood wall treatments are a tasteful and trendy addition to any commercial or residential space. So what does it take to pull them off? When it comes to wood wall treatments, a little can go a long way. Using wood materials in targeted areas rather than over an entire surface is a simple trick for composing exciting, dynamic designs. A great example of this can be found at the Dandelion Conscious Cafe in Irvine, California. The hip eatery set out to give their interior a fresh look with earthy touches. When deciding how to spruce up their walls, using Nydree flooring planks for select sections seemed like the perfect idea. Engineered wood planks in a subtle gray tone were placed diagonally along an upper strip of wall that wraps around the interior. This added texture and movement to the space, upgrading its modern aesthetic. The light weight of the engineered wood planks made them easy to install and didn’t overburden the walls. Whether you want to add stylish accents to a busy cafe, family home, or office space, engineered wood planks are a great choice, both for flooring and as wall accents. 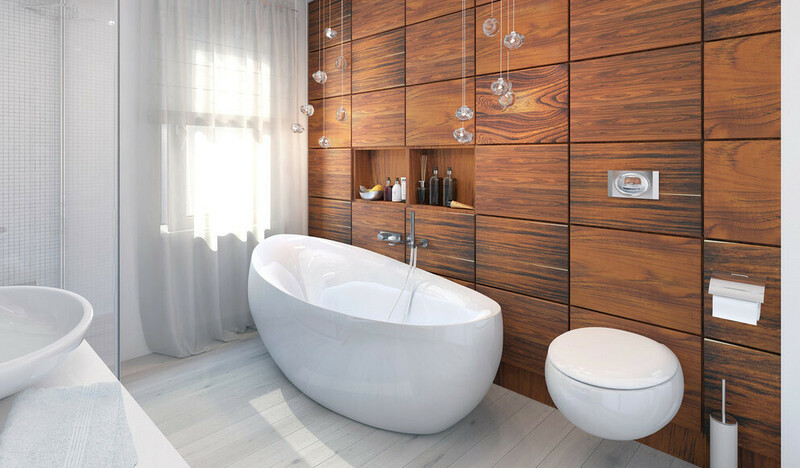 Designers and homeowners used to avoid using wood in warm, humid spaces like bathrooms. But modern manufacturing methods have made many of today’s engineered wood planks robust enough to withstand regular exposure to heat and humidity. They sport an acrylic-infused top layer that resists warping, so you can now bring the warmth and natural appearance of wood right on in to your bathroom. And, while you can definitely use engineered wood planks for bathroom flooring, don’t let that limit you. Consider using them on the walls too, as in the bathroom pictured above. This luxurious South African residence was designed to reflect the natural features of the surrounding landscape. The en suite bathroom accomplishes that by featuring sleek wood cladding, rustic colors, and organic materials throughout, adding a hint of earthiness. The strips of narrow mirrors dispersed throughout the wood break up the surface and keep it from looking one-dimensional. The result is a refreshing departure from typical bathroom design, which can sometimes appear cold and sterile due to exclusive use of tile or stone. This impressive home was featured on the show “Top Billing.” You can get an inside look at the whole home and learn more about the designer’s approach here. The great thing about wood is that its earthy hues and rugged texture naturally add warmth wherever it’s used. This principle can be leveraged to create a cozy ambiance, even in modern, minimalist spaces. 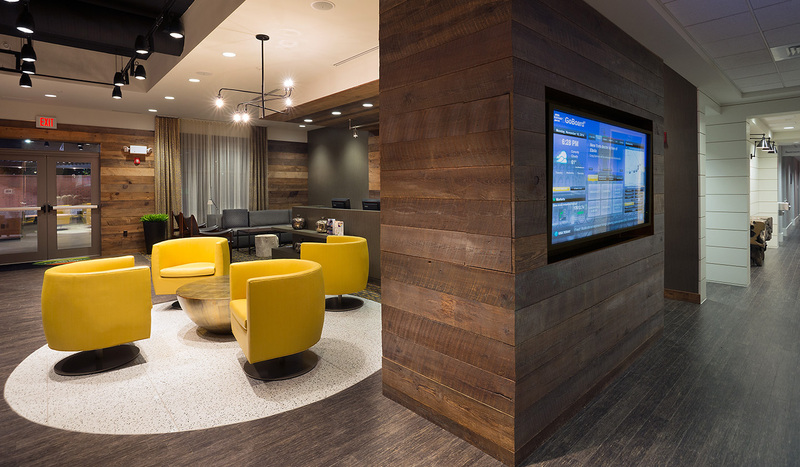 Courtyard Marriott in Summerville, South Carolina, did exactly that when they revamped their lobby. Aiming to make the space more inviting to guests, the hotel chose to use Nydree COR Wenge flooring. This created a sleek yet richly textured foundation, which was complemented perfectly by wide, beautifully worn planks used on the walls. The varied golden tones of the wall planks add radiance to the space, picking up on the bright accents of yellow seating. The wood cladding also softens the presence of ultra-modern light fixtures and technology, such as the large TV. If you’ve been wanting to make a room in your home more inviting without having to give up modern design elements like bright colors and cutting-edge electronics, this hotel serves as inspiration. Using wood in this way strikes the perfect balance between a cool, contemporary style and an inviting warmth that will make your guests feel right at home. Whether you’re a professional designer or a homeowner who wants to add something special to your walls, don’t be afraid to experiment with wood. Even small accents can enliven drab interiors and add character to a room. Fortunately, with the wide range of high-quality wood products on the market, you’ll be able to choose beautiful materials perfectly suited to your needs.